Kingdom of Ruhuna (210 - 161 BC). The first king of the Rohana Kingdom was King Mahanaga.He was the brother of King Dewanampiyathissa in Anuradhapura main Kingdom. after king Mahanaga, his son Yatalathissa came as the new king in Ruhuna.he built The Yatala vehera (near Thissamaharama) & Kalaniya vehera. the third king of Ruhuna was King Gothabhaya. after him, King Kawanthissa built the Rohana Kingdom strongly. King Dutugemunu was the son of King Kawanthissa. he defeated the chola king Elara & united SriLanka under one government. The Kingdom of Ruhuna became the major kingdom on the island after a South Indian invasion by Rajaraja I of the Chola kingdom. 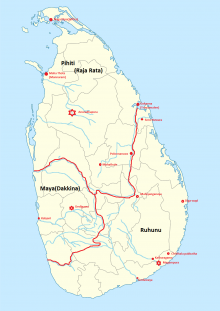 Godavaya is located on the coast of Sri Lanka. Here Sri Lankan and German archaeologists excavate the old Kingdom of Ruhuna, gathering evidence of its glorious past. Excavations have been carried out since 1994, under Professor Helmut Roth of the University of Bonn in Germany, along with the Sri Lankan Archaeological Department, directed by Director General Dr. W. H. Wijeyapala, and the German Archaeological Institute (DAI). Recently they excavated the temple area of Gotha Pabbatha Rajamaha Vihara in Godavaya. The temple area was not only religious, but it was also used as an administrative centre during the reign of King Gajabahu I. A unique Brahmi inscription on a rock next to the ancient shrine room clearly states that this was indeed a significant sea-trading place. True to Sri Lankan tradition, Ahalaya, one of King Gajabahu's ministers, has immortalized himself by getting his name carved in an inscription on this rock. In ancient times, Sri Lanka was heavily involved in the sea trade and exported dark red garnets. Up to the 7th century AD, these semi-precious stones were found as burial objects as far away as European graves. New research has now revealed that most of those garnets were from India and Sri Lanka. Spices were also exported from the island. The dig has uncovered Sassanian (Persian) and Chinese pottery as well as Roman coins.